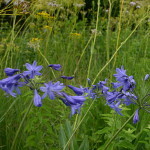 Explore the most comprehensive Grassland Biome indigenous plant library! Use the Indigenous Plant Palette Selector to find a specific indigenous plant or to create a list of plants for your project. 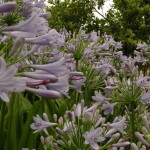 This dainty deciduous agapanthus from the Drakensberg, is a good choice for gardeners in cold areas who struggle to grow evergreen agapanthus. 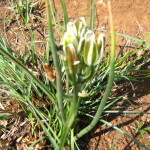 This Agapanthus has long-stemmed umbels of pendulous flowers and occurs naturally in very cold grasslands. This plant requires little care and looks good all year round. 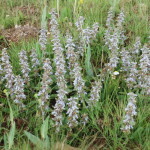 Ajuga ophrydis is a very unusual plant with beautiful blue flowers that should be interplanted with grasses. This majestic plant with its yellow flowers does well in sun and semi-shade but must be kept on the dry side. 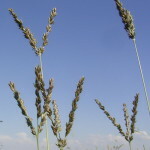 Interplant with small grasses. 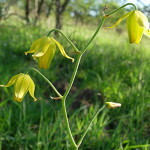 Albuca nelsonii is quite a majestic plant for a rockery, even when not in flower. The white and green flowers also last very long. It blendfs very well with grasses. 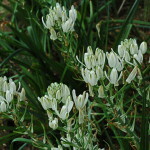 Although quite small, the white flowers are a welcome site on a rockery, especially if interplanted with small grasses. 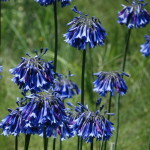 A worthwhile garden subject for sun or semi-shade. 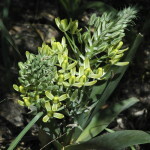 Plant in a grassland garden amongst small grasses where the bell-like nodding yellow flowers appear above the grass. The spikelets of this tufted, perennial grass are typically dark grey and quite conspicuous. 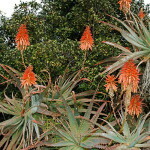 A branched, attractive succulent that provides food for sunbirds in winter as well as attracting insects.